As the fourth generation milestone series descendant, the release of Motorola Droid 4 is of twists and turns. After repeated exposures, and here comes with the official release of Motorola Droid 4 and it will be displayed by MOTO on CES this year. As the indication of its name—Milestone, it has been always the classic for consumers. 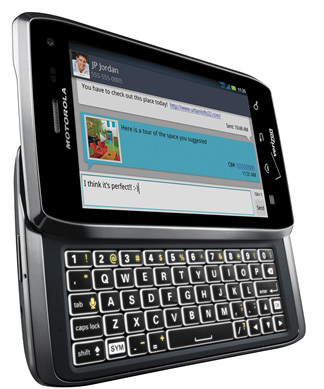 The four generation Droid 4 employs the traditional sliding full keyboard, at the same time, the phone shape is designed as the blade series with sharp angle. The 12.7-mm ultra-thin body adds fashionable elements to this mobile phone. Expect for the fashionable appearance, Motorola Droid 4 is also with powerful hardware configuration. It adopts the 4.0-inch touch screen and with resolution classified as qHD level. Equipped with TI 1.2GHz dual-core processor and 1GB DDR2 RAM. This phone is also with built-in 8-million-pixel camera, supporting 1080p full HD video recording. For the sake of providing 4G network support, the front0facing camera is attached to Droid 4 as well. As to the operating system, Motorola Droid 4 is running on Android 2.3.5 system. And the officials have made a promise that it will be upgraded to Android 4.0. The popular “cloud services” function is added to MOTOROLA Droid 4, and 1785 mAh battery can also guarantee the phone good endurance ability. It is reported that Motorola Droid 4 will be put into the market officially within a few weeks and the contracted price is $199.99.